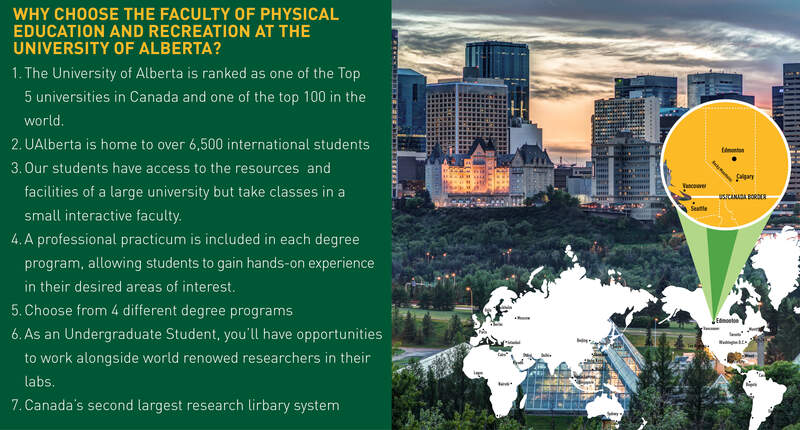 Information for Prospective and Current international undergraduate, visiting, and exchange students in the Faculty of Kinesiology, Sport, and Recreation. If you are a current student within the faculty and are looking to Study Abroad please visit here instead. Information for incoming Exchange or Visiting students who are interested in studying at Faculty of Kinesiology, Sport, and Recreation for 1 or 2 semesters. Information for academic scholars, visiting professors, or self-funded researchers, interested in an academic based visit the Faculty of Kinesiology, Sport, and Recreation. Varying periods of stay dependent on each visitor. Find out about our customized 2 to 4-week program for cohorts of students from partnered institutions. This provides opportunities for participants who are interested in an authentic Canadian cultural experience.